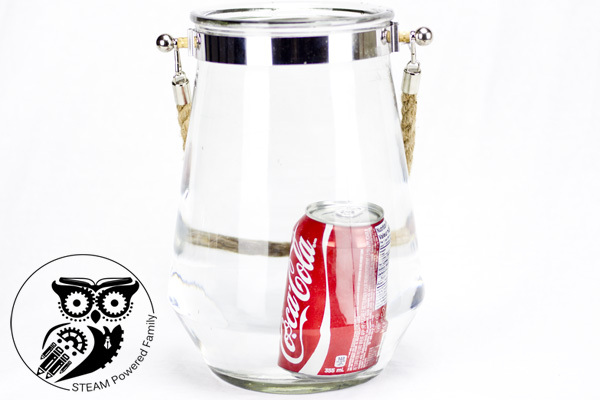 Do soda pop cans float or sink? The answer may seem simple, but not so fast! There is some really cool science behind the answer and all may not be as it seems. So what did you guess? Float? Sink? Guess what? You are both right! See, told ya, cool science. This activity is the perfect camping challenge. Who hasn’t sat around the campsite, a cooler full of ice and soda pop cans at the ready. As the day goes on the ice slowly melts leaving the cans in water, but do they float or sink? Inquiring minds wanted to know, so we set off to do some experimenting. This is a super easy activity to do, but the results are amazing. All you need is a large container, some water and a variety of cans (new, unopened). First up, we tested a can of regular Coke. We slipped the can into the water and it… sank quickly to the bottom. But as we watched it sink we realized something cool, some bubbles escaped from under the can, so that gave us an idea. This time we placed the can very carefully straight up and down into the water and it floated! As long as we kept that air bubble in the concave bottom of the can, it was able to float. 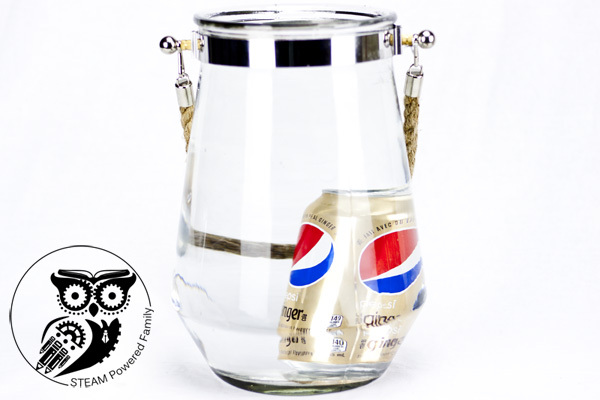 We repeated with the Pepsi Ginger, a regular pop with a ginger flavour added to it, and got the same results. 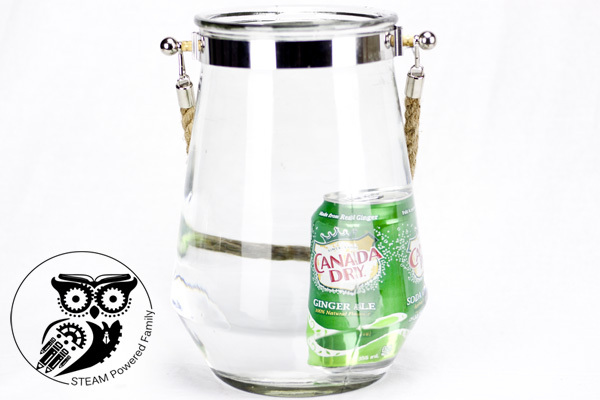 Canada Dry Ginger Ale gave the same results. We figured we had this activity down, then we put in the Diet Pepsi and it… floated! We wriggled it about to make sure there was no air bubble underneath, but it continued to happily bob along at the top of our jar. Now we had some really cool results and science to explore! Our original question was: do soda pop cans float or sink? We had already discovered we could make it float, but that generally they sink, now this one can was throwing us for a loop. We hit the books, did some research and found some fascinating answers. Our cans were all the same size and volume. So what could possibly account for the difference? That’s right. The regular pops have sugar, and lots of it. Diet pop uses artificial sweeteners that are much stronger or sweeter than sugar, so only a small amount of sweetener is needed. The difference between the amount of sugar used in regular pop and sweetener used in diet causes a significant difference in the density of the liquids. Regular pop is more dense than water, therefore it sinks. This is called displacement. 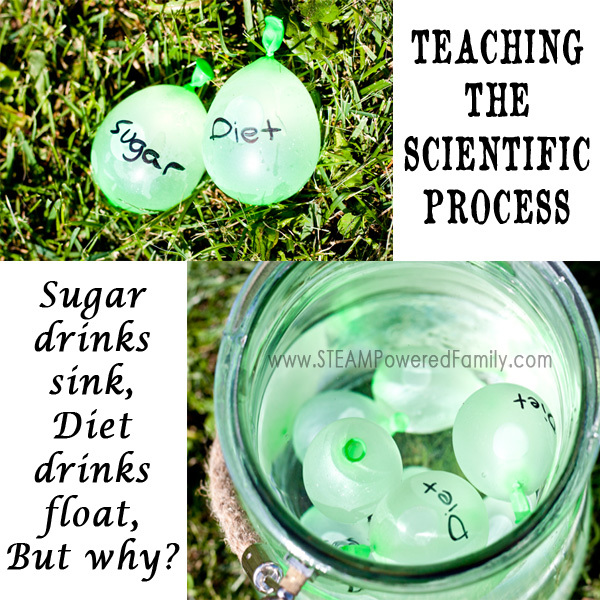 Diet pop is less dense than water and weighs less than the water it displaces, this causes it to float. To further prove this theory regarding mass and density we weighed the cans and the diet pop weighed an average of 20 grams less than the regular pop. This is despite the cans having the exact same volume and being in every other way identical. Now, once we got to this point I simply had to test one more thing. A beer can. And guess what? It floats! The reason is that all the sugars are fermented out in the alcohol creation process, which results in a liquid that is less dense than water. Again, weighing the can showed it weighed about the same as diet. 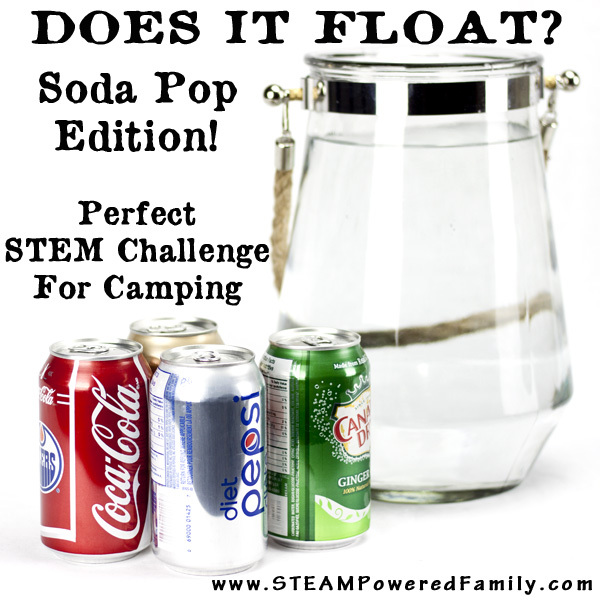 So next time you are camping, do a little STEM work and wow your fellow campers as you make some cans float and other sink, all with science. 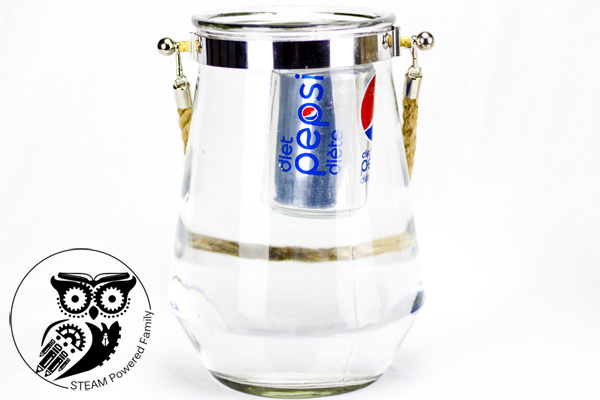 Make sure to ask your crowd: Do soda pop cans float or sink? first, then wow them with the results! Take this lesson one step further and learn the scientific process by doing another experiment. This time providing a proof of concept that it is the different density of sugar water vs artificial sweetener water.